Sync & Charge plus Hi-Fi quality Line Out Audio wherever you go. Use existing USB wall or car chargers or simply unplug the standard 5-pin Mini USB cable from that digital camera, portable hard drive, GPS, PDA etc. 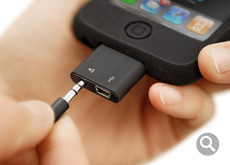 to charge your iPod’s/iPhone’s battery or synchronize data. 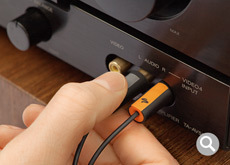 The PocketDock Line Out Mini USB allows you to easily connect to your home or car stereo or DJ equipment with crystal clear, pristine audio quality. The possibilities go far beyond just music from the iPod: Get an iPhone app like Pandora, ooTunes or Sirius XM and listen to Internet or Satellite radio streams on the road. Experience a whole new level of your iPhone/iPod games with powerful sound from big, bold speakers. Side effect: Line Out consumes slightly less power, resulting in longer iPod/iPhone battery life. Slim style, 6 ft. (180 cm) in length, with thumb-friendly shaped RCA (Cinch) plugs. 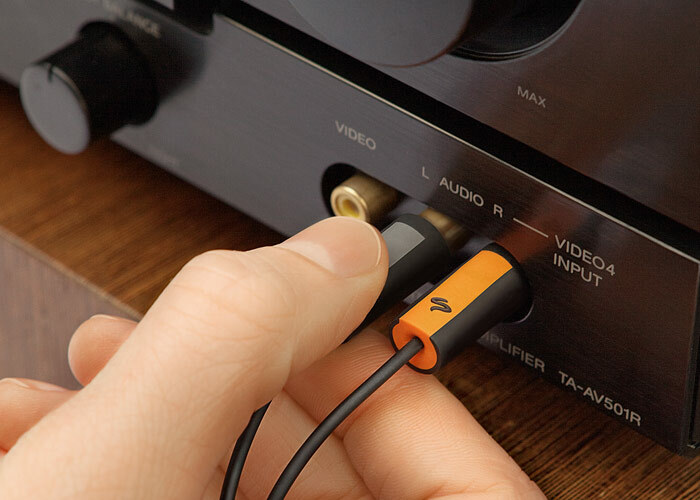 Line Out and USB can be used either separate or both together at once, allowing you to charge the battery while enjoying Hi-Fi quality audio at the same time. The PocketDock Line Out Mini USB is so incredibly small, it even fits into your wallet. And it doesn’t cost a fortune either. Grab one today and never miss a connection again! "...I cant do without it." "...a more compact replacement for the Dock, plus great cables..."
"...two free stereo cables that complement the iPod well and are very 'Apple-like'." "...worth every single penny ...a must have for every iPod user." 3G iPod models (touch-wheel) DO NOT support USB charging. Pick a PocketDock Line Out FireWire instead. This PocketDock fits all cases. Click here for details.